Stephanie is the Poetry Editor for Raw Dog Screaming Press, an adjunct at Western Connecticut State University and Point Park University, and a mentor with Crystal Lake Publishing. 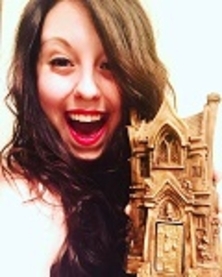 She is a member of the Science Fiction Poetry Association, an active member of the Horror Writers Association, and a graduate of Seton Hill University’s MFA program for Writing Popular Fiction. Her Bram Stoker Award-winning poetry collection, Brothel, earned a home with Raw Dog Screaming Press alongside Hysteria: A Collection of Madness, Mourning Jewelry, An Exorcism of Angels, and Sheet Music to My Acoustic Nightmare. Her debut novel, The Eighth, is published with Dark Regions Press. Stephanie's poem, "A Hanger in the World of Dance," was published in A Plague of Shadows: A Written Remains Anthology.